Loess–paleosol sequences in the Vojvodina region in the southeastern Carpathian Basin have been intensively studied to obtain a high-resolution stratigraphical framework for the Upper Pleistocene in this part of Europe. In these studies, millennial-scale sedimentation variations in the Upper Pleniglacial have been coupled to the Greenland Ice dust record, indicating that the rapid climate variability characterizing the North Atlantic and Greenland areas, is reflected in the loess deposits at the southern edge of the European loess belt. Rapid variations were recently also reported for the stable isotopic composition of organic matter in the Surduk loess-paleosol sequence, located in the Vojvodina region, andwere interpreted as episodes of increased C4-vegetation over the last glacial period. Based on potential coinciding changes in oceanic and atmospheric circulation patterns, these episodes were attributed to plant moisture stress rather than by fluctuations in temperature, although exclusive proof has not yet been provided. Herewe report a high-resolution record of continental air temperature and precipitation over the past 40,000 years based on soil bacterial lipid signatures preserved in the Surduk loess–paleosol sequence. Our temperature record shows a gradualwarming trend, suggesting thatmoisture availability indeed seems to be the main factor driving the excursions to C4-vegetation around Surduk.We also find that continental air temperature changes in this regionmay be seasonally biased, andwere driven by regional influences rather than by Northern Hemisphere climate forcings, likely as a result of the inland isolation of the Carpathian Basin by surrounding mountains. 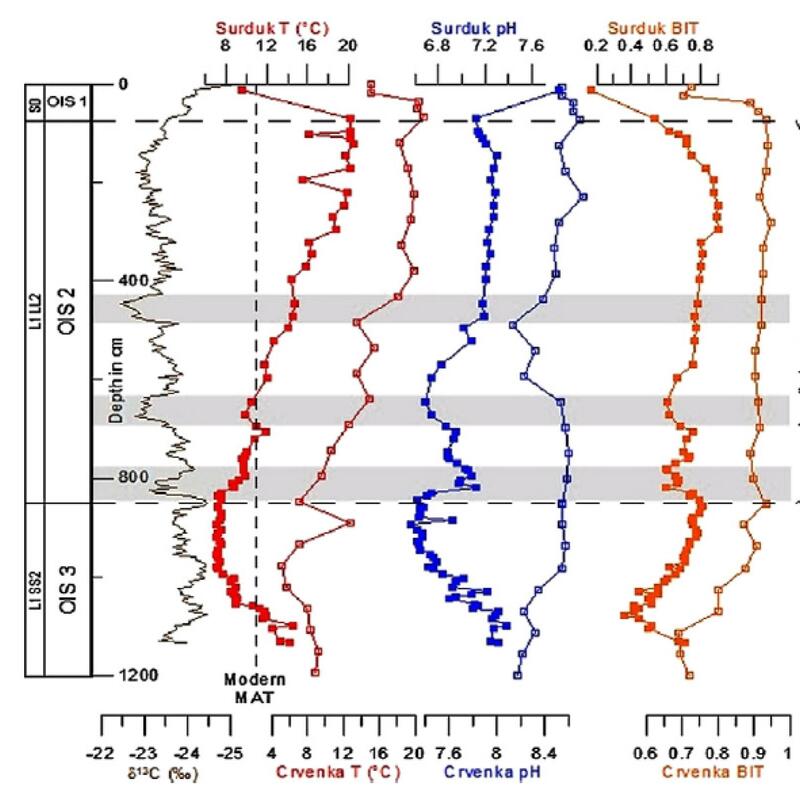 Support for a regional climate driver comes from comparison of our lipid based temperature and precipitation records with similar records from the near-by Crvenka loess–paleosol sequence, which resemble the climatic trends recorded at Surduk. Schreuder L., Beets C., Prins M., Hatté C., Peterse F.
(2016) Palaeogeography,Palaeoclimatology, Palaeoecology, 449, 141-148..